Everyone behaves differently as a roommate, some are very courteous while others might be a bit messy and difficult to live with. 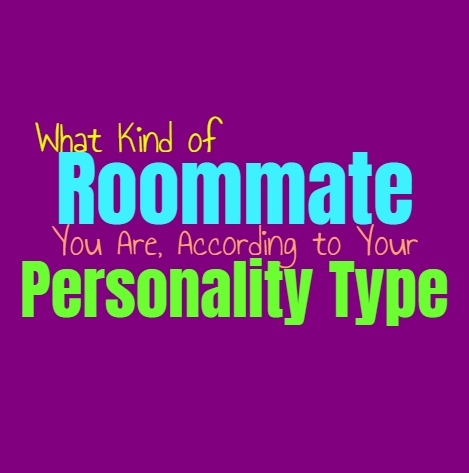 Here is what type of roommate you are, based on your personality type. INFJs are often rather courteous roommates who do their best to keep their things to themselves and not invade others personal space. At the same time they enjoy keeping to themselves and can become annoyed when their roommates do not respect their boundaries. INFJs are capable of being considerate of others, but when they feel like they aren’t being respected they can become a bit short-tempered in this type of environment, since they really do need plenty of space and time alone. ENFJs are often the thoughtful roommates, who always try to be considerate of those around them. They are likely to hold household meetings and try to keep everyone organized and focused. They want to be able keep everyone together and avoid too much discord in their environment. ENFJs will go out of their way to do nice things for their roommates but they want to be sure that everyone is pulling their own weight as well. They can become a bit annoyed with people who are rude and don’t considerate everyone else when they do things. While INFPs try to give others space and be considerate roommates, they aren’t always great at keeping up with household chores. They will do their best to maintain these things but have a tendency to forget and this can upset their roommates. INFPs just don’t really like having to follow certain rules and don’t like the pressure of performing tasks by a certain time. They sometimes leave things a bit messy until they personally feel like cleaning up. This is something that can be frustrating to others, but INFPs can also be very considerate and warm roommates which can balance it out for the right people. ENFPs as roommates do their best to be considerate, but they can be in their own world sometimes. They are capable of cleaning up, and might be more organized with some things than people realize. They do their best to pull their own weight and do want things to be fair. ENFPs as roommates will certainly be capable of keeping up with certain tasks, but if they have days they don’t want to do them then it becomes frustrating for them when people demand it. They don’t like rules or feeling bossed around, and so sometimes they can become irritated with their roommates. INTJs as roommates often believe in maintain their space but following rules as well. They might be the ones who set up certain chores for everyone and believe that it is important that these be followed. They don’t simply accept living with people who cannot hold up their end of things, and want to be sure that the situation is fair. INTJs can become truly annoyed with most roommates though, since they enjoy having plenty of space and don’t like when they feel like someone is not respecting their boundaries. ENTJs as roommates can make the experience fun but they also want to be sure that everyone maintains their chores. They often believe in setting up rules and chores for the household so that there isn’t a sense of resentment among everyone. ENTJs realize the importance of these rules so that they don’t have to deal with people constantly disrespecting their boundaries and acting sloppy in their home. They are more than capable of getting things done and taking care of their chores, and become annoyed if they have to pick up the slack for someone else. INTPs as roommates really just want to have their own space respected. They enjoy being able to keep to themselves most of the time and become frustrated if this is not accepted by others. As roommates they might spend a lot of time in their own room, and only emerge when they feel like being around people. INTPs might not always be great at keeping up with their chores though, and prefer to have freedom to tend to those things when they want to. ENTPs as roommates often want to make things fun and don’t like feeling like they have tons of rules to follow. They do however, believe in respecting their roommates and will do their best to keep up with the more important chores. Their bedroom might be a mess but they don’t want to let this seep into the rest of the house. They want to be sure that they are respecting their roommates since they want to receive this in return. ENTPs simply want to have their own space but also enjoy having people they can hang out with all of the time. ISTJs are often very polite and respectful roommates, who believe in maintaining space in the household. They keep up with their chores but want to be sure that everyone else does as well. People who continuously make mistakes and leave messes can become extremely frustrating for the ISTJ to live with. They can seem a bit demanding sometimes with these things, but they are particular about how they want things done. ISTJs also don’t like when people disrespect their hours of work and the times they need to be able to sleep. ESTJs try to be respectful of their roommates, but sometimes they can appear a bit bossy. They simply believe in setting certain household rules so that people don’t feel like they can do anything without respecting those around them. ESTJs often believe in having a list of chores that everyone needs to maintain, so that it does not end up falling on one person. If they are the ones doing all the chores, they ultimately believe in being allotted a bit more respect than those who are messy and don’t keep up with things. ISFJs as roommates often become the mothering ones of the household. They want to take care of everyone and make sure their roommates are safe and happy. They also believe in bringing everyone together and try to make sure that their roommates are all getting along. ISFJs do sometimes take on more chores themselves, not wanting to be too pushy about everyone else doing them, but they can get really upset if this is taken for granted. ESFJs are often courteous roommates, who do their best to take care of their chores and even help out with others when they can. While they are often giving and considerate roommates, they can become annoyed when they feel like they aren’t being appreciated. If everyone seems to do whatever they please without consideration for the ESFJ, they will likely lose their patience and can become a bit on edge and even short-tempered with their roommates. ISTPs as roommates enjoy having a good time but they also want to have their space. They do their best to enjoy the presence of their roommates and really just want them to respect when they want to be alone. ISTPs really just want to have a sense of freedom without feeling like they constantly have to answer to their roommates and do as they say. They can sometimes have trouble keeping up with certain chores, but only the ones they don’t find all that important. ESTPs as roommates can be a bit messy sometimes, not always capable of keeping up with their chores. They aren’t always great at being organized and can find themselves struggling to clean up sometimes. This is because ESTPs become distracted and want to be able to do things without feeling like they have to follow certain rules. As roommates they try to be considerate but they can sometimes be a bit more demanding than they realize. ISFPs as roommates do their best to be caring towards those around them, but they can be caught up in their own little worlds sometimes. ISFPs can have a hard time having to maintain household chores since they don’t enjoy having to follow rules and demands of others. They become so caught up in their own imaginations and thoughts that they don’t really find it easy to focus on doing the things others expect from them at the exact moment they demand it. ESFPs as roommates are often energetic and fun people to be around, but they aren’t always great at chores. They might not be good at cleaning up after themselves when others expect them too, but they are good at lifting others up when they are feeling down. ESFPs know how to have a good time and want to be able to be around people who are willing to join in on the fun with them. ESFPs might not be great at realizing when someone wants their space, but their intentions are good.